This post contains news and highlights about the last League of Legends Quarterfinals match between LPL's Team WE and NA LCS' Cloud 9. 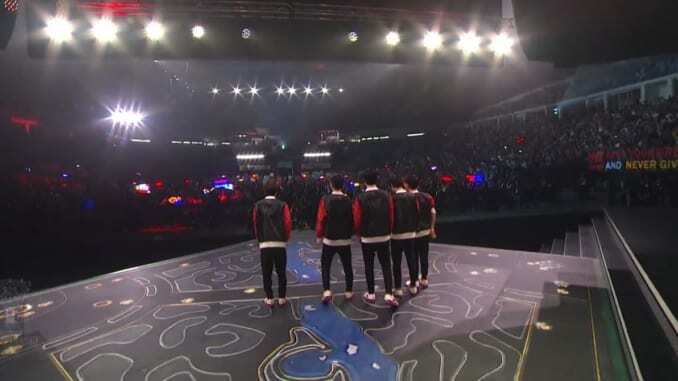 Guangzhou, China – China’s Team WE capped off the League of Legends Quarterfinals with a hard-fought 3-2 win over NA LCS’ Cloud 9 in a grueling Best of 5 Series. Arguably the closest series in this year’s League of Legends Quarterfinals, Team WE and Cloud 9 gave it their all up to the last match. It was a tale of two teams itching to get into the next stage of Worlds – Team WE’s quest to reach the finals has been 5 years in the making, while Cloud 9 is NA LCS’ last hope of having a team to represent them in the Worlds. Cloud 9 set their sights on winning the first game with Jensen picking Aurelion Sol. This led to early ganks and a good early game lead for Cloud 9. However, Team WE managed to delay the game and let Mystic farm his Kog’Maw, and after 55 minutes, Team WE’s dual-ADC composition proved to be too much to handle down the stretch. Game 2 saw Cloud 9 take the game in a big way by letting their Top Laner, Impact, blind pick Singed. The gamble worked – Impact was able to get the upper hand against the enemy Maokai. Cloud 9 picked their fights as well, on their way to securing crucial objectives and eventually the win. Cloud 9 continued their dominance in the third game, en route to having their cleanest overall game so far. A crucial early-game team fight saw Sneaky’s Tristana having a significant gold lead against Mystic. This helped Cloud 9 capture objectives and their second win in the series. With the series’ end in sight, Cloud 9 was set to move onto the next stage. Team WE, however, had other plans. They bounced back by drafting a meta and engage-heavy team, thanks to Condi picking Jarvan IV and Ben choosing Rakan. The LPL team picked easy-to-win clashes which was instrumental in taking Game 4. The final match saw Cloud 9 make some critical errors during the picks and ban phase. They gave Janna, Galio, and Kog’Maw to their LCL opponent and they made the most out of it. Xiye’s Galio was nigh unkillable and each team fight and objectives they won had them gain gold advantage until Team WE won in about 33 minutes of action. For more League of Legends Worlds coverage, visit our Worlds 2017 Page. You can also check out Riot’s E-Sports page for more in-depth statistics.